Love it . Great spiritual tool. I have found that the Life Application Bible via iPad allows me to be portable and takes away the “excuse” of not reading the Word because of having to lug a paper Bible around; too easy to not read rather than to read. I like the commentary alongside the scripture as it helps me put things in perspective so as to be placed into use in my life. This app is good when you learn/ know how to use it. However I didn't realize that I was buying only the NLT version and when I wanted to find another version it was this non stop sales pitch for numerous other add on Bible options at $20 extra (some more than that) and none of them offer a reading aloud option. You have to pay extra for that too! A little ridiculous for the price in my opinion. 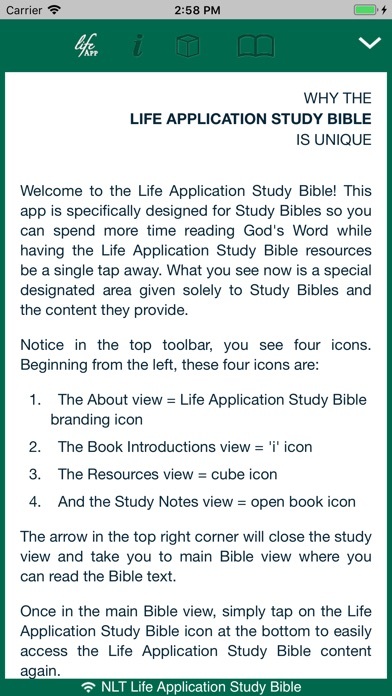 This Bible apps is very helpful and handy in my study of the Bible. 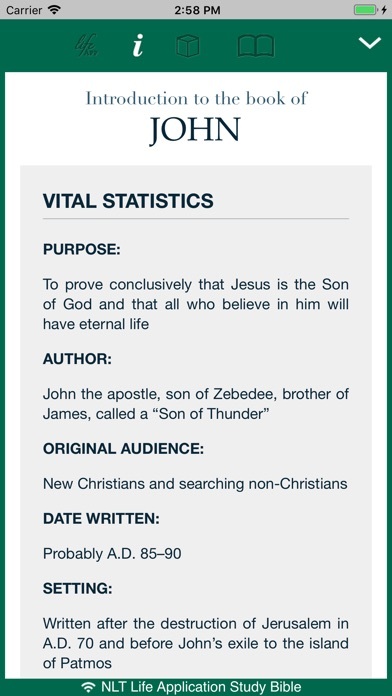 Love My Life Application Bible App! I have owned the Life Application Letters book for years and always went to it for helping me understand various sections in the New Testament for general study or sermon preparation. So I decided to see if I could get the entire Bible version for my iPad and I have used it extensively ever since. It's pretty easy to navigate and I enjoy studying from it every week. Well worth the money! in my opinion, the best iOS and Android Bible app for English language study. Why? Very usable and intuitive. Great bookmarking and notes ability. Many translations and resources available for purchase—both commentaries and especially study Bibles. the recent change to allow 10 items on the Recent Items list is greatly appreciated. the new downloads ‘category’ might be useful to some users, but has a small downside that could be improved upon suggestions for improvement (not in any particular order): 1. perhaps a Bible dictionary tab could be added. initially this might just have a search area to find articles, later on it can be linked to the actual words of individual Bible translations. 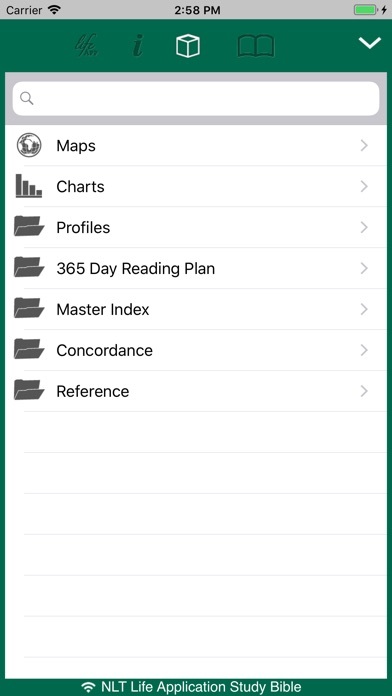 2. upgrade to the Strong’s concordance to also allow for a simple listing of every usage of a particular word, but still keeping the ability to see usage by English word translation and Bible Book. due to the following recent update to the various Apps by Tecarta... the download ‘category’ now makes it a bit difficult, in some cases, to see if Tecarta has any new offerings in a particular category. Prior to this upgrade all a user needed to do was to expand the category (e.g., Study Bibles) and see what has yet to be purchased. now, the user needs to scroll through a list of both purchased and yet-to-be-purchased items in that category to see if any new resources have been added—this takes a bit more time and is a tad inconvenient. so, perhaps either or both of the following suggestions could be implemented ... 3. change the color of those resources that have not yet been purchased (this would include both older and recent new additions) to make it stand out from those that have been purchased and are either installed or purchase and yet to be installed. Better would be to use 3 colors for the ‘circle’ to the right of each resource—one color indicated purchased and installed, another color indicates purchased, but not installed, and the third color for all unpurchased resources in that category. 4. add a ‘Store’ category that would work like the categories worked previously, viz. they would only show unpurchased resources for each category of resource. many thanks for developing one my most frequently used Mobile apps. great job! This app does not disappoint! Excellent!